The Houston Texans selected Whitney Mercilus out of Illinois in 2012 with the 26th pick, as the team needed him to step in and replace the recently departed Mario Williams in the sacks department. 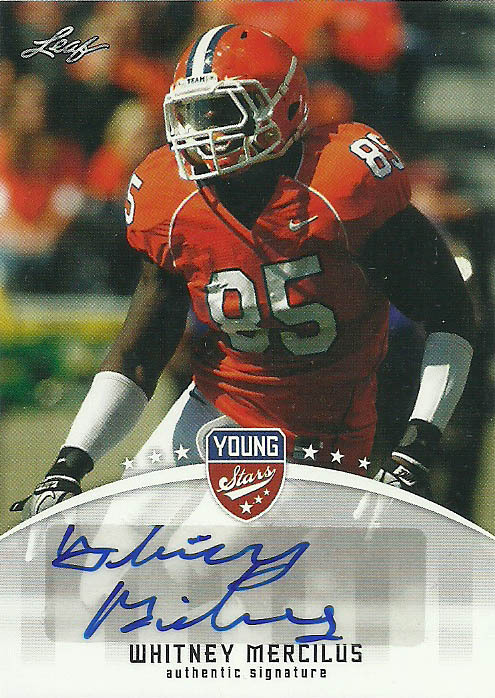 A late bloomer, Whitney earned multiple awards in his breakout college season of 2011, before declaring for the NFL Draft. That season at defensive end he led the nation with 16 sacks, and a hefty 9 forced fumbles. It was not a bad rookie campaign for Whitney. He started 4 games and recorded 6 sacks, 18 total tackles, while forcing 2 fumbles, honing his skills under legendary defensive coordinator Wade Philips. It wasn’t really until 2015 that Whitney truly had his breakout campaign for the Texans. Shifted back and forth from defensive end to linebacker, Whitney had 12 sacks, 50 total tackles, and 2 fumble recoveries, nabbing second team All-Pro Honors. While he had a respectable follow up in 2016, with 7.5 sacks, 4 fumble recoveries, and 53 total tackles- to go along with the league’s best defense, Whitney’s 2017 campaign was a complete wash as he blew out his pectoral game during the 5th game of the season landing him on IR- He’d finish the campaign with 10 combined tackles and 1 sack. Mercilus returned for the 2018 season and posted 39 tackles, 4 sacks and 2 forced fumbles. After striking out on Whitney at my last great marathon Houston run, due in part to it being held at a Palais Royale location, I just opted to pick up this Leaf card of him instead. I had not been counting on an event with Whitney that day, but after receiving a tip at the stadium after getting Charles James, Lance and I decided to take a shot. We arrived and stood outside. I exchanged pleasantries with one of the hosts outside for the Texans. She dryly informed me that the event was a Battle Red Ladies event only and wasn’t for outside fans. I then watched Whitney drive up in his Porche and park then go inside. I was upset, but that’s the rules. Later that evening I saw on the news another fan who was in line with me earlier in the day. Notably it was a guy- so he shouldn’t have been able to get an autograph either but maybe his mom was there. I’m still in pursuit of Whitney on a few cards. I have begun to refer to him as one of my ‘white whales’- that being a player that I seem to have trouble getting that I really want. This is a nice entry from Leaf. The photography and the shot are pretty nice, and the autograph is definitely showcased on the canvas. Not a fan of the logo placement, dead short of center, but it’s all a pretty simple, clean, set up. Whitney must have learned his lesson from signing these cards. You can see that over time his autograph just seems to get weaker and weaker from signing so many stickers. It’s common now to see that he short signs his autograph with WM#59.